The world looks to Germany to be a leader in Green Energy. There’s been a great deal of hype surrounding Chancellor Angela Merkel’s very ambitious goals of dramatically reducing the county’s emissions by 2020. Yet the German experience should also provide some pause to President Obama and others proposing such changes in the United States. It turns out that goals are potentially unrealistic, perhaps even dangerous, for numerous reasons. One reason that makes them so unrealistic is that they are seriously hamstrung by effectively cutting off the single largest source of CO2-free energy available anywhere in the world right now: Nuclear Power. This reflects how much Germany has been influenced by green politics. In the years of the Socialist-Green government stretching from 1998 – 2005, nuclear power was considered an anathema. The Green party has its roots in the anti-nuclear power movement of the seventies. One of the most important items on their agenda when they came into power was to completely eliminate Germany’s use of nuclear power in the now infamous Atomaustieg or Nuclear exit which mandated that Germany no longer use nuclear power by the year 2020. When Chancellor Merkel took power under the Grand Coalition of Christian Democrats and Social Democrats, this policy remained in place even as the government pledged it would dramatically lower Greenhouse Gases by 2020 as well. Although the Christian Democratic Union (CDU) has been arguing for a repeal of the ban on nuclear power, the coalition continued to eliminate this most effective means of GHG reduction, placing its bets on conservation and renewable energy. Ironically Germany remains one of the leading countries when it comes to nuclear technology. Areva, France’s nuclear leviathan has a large R&D facility here in Germany, where I myself once worked as an English language trainer. The German engineers working here in Erlangen are regularly sent abroad to help with the building and maintenance of nuclear plants throughout Europe and the rest of the world. German engineering is being used in Finland, Bulgaria, and Sweden. Some of the engineers have even helped build a high-pressure reactor in Lynchburg, Virginia. I have worked with these people and they include some of the best minds in the field. Germany’s desire to reduce greenhouse gases and live without nuclear power has taken some almost absurd turns over the years. For one thing, Germany appears to be turning to its single cheap and abundant supply of energy, albeit a very dirty one, coal. Germany has both some cleaner anthracite and a lot of very dirty bitumen mines. These mines provide an enormous portion of Germany’s electricity and are also one of the reasons why Germany’s lights won’t go off even if all the nuclear plants are turned off. Coal power plants are being built across the country – even the Greens in the Hamburg government have allowed massive plant to be built in the city with some very strict regulations. The single most absurd aspect of the Green’s desire to eliminate Germany’s reliance of nuclear power are massive subsidies that it has provided for both solar and wind power generation. Germany, while not the gloomiest country in Europe, is not exactly sunny. It has huge annual amounts of precipitation and dark, grey winters. Subsidies, as well as its renowned industrial prowess, have turned the country into one of the leading producers of solar power. Yet this is not an unalloyed advantage – despite the constant claims made about “green jobs“ here in Europe as well as North America. Solar power is enormously expensive and inefficient here, most notably lacking the reliability needed by all major power suppliers. It only produces power when the sun shines, and it is very tricky to store the energy created, especially with photovoltaic sources making it enormously expensive. Some forms of solar power have been able to store off-peak power production; the parabolic-trough plants in Andalusia or the Mojave deserts use molten salts stored en masse to assure 24-hour supply, but these technologies, though provided by German companies, cannot be implemented in Germany itself due to the lack of intense sunshine about 6 months out of the year. And then there’s wind. Wind has all of the drawbacks of solar but the advantage that Germany is at least fairly windy. Wind power has taken off here and the Baltic and North Sea coasts are dotted with enormous wind parks. The costs are still enormous and wind or solar power are still far more expensive than standard sources of power. A May 12, 2008 editorial in the Wall Street Journal stated: "For electricity generation, the EIA concludes that solar energy is subsidized to the tune of $24.34 per megawatt hour, wind $23.37 and 'clean coal' $29.81. By contrast, normal coal receives 44 cents, natural gas a mere quarter, hydroelectric about 67 cents and nuclear power $1.59." Costs have come down recently due to the explosive growth in the sector over the last few years. The U.S. Energy Information Administration estimates that wind costs $55.80 per MWh, coal at $53.10/MWh and natural gas at $52.50, and the costs for wind fail to take into consideration the costs of owning and operating a conventional power plant to provide energy when the wind is not blowing. Explosive growth over the last few years has allowed companies to exploit the economies of scale created by large-scale production. German wind-turbine producers have been able to maintain a fairly large presence on the market but have been muscled out recently by American and Indian manufacturers. Wind-power will never be able to provide more than 20% of the power mix by most projections. As with solar, there is insufficient storage technology affecting solar; the appropriate areas have been built out. There have been murmurs about the possibility offered by off-sea wind parks but these are also enormously expensive to build and maintain. 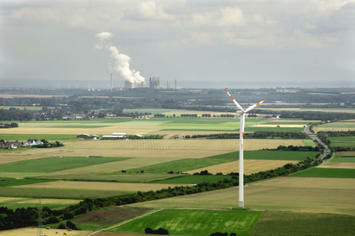 Germany has shunned nuclear and coal in an attempt to use wind and solar. Renewable sources are not only much more expensive but also cannot begin to provide the amount of energy at economical rates. Germans are also big fans of natural gas but the problem is Germany has very little of it. Germany has had to import its natural gas, some from fairly reliable partners like the Netherlands and the United Kingdom but mostly from an increasingly assertive and authoritarian Russia. This leaves Germany with a series of problems with no pleasant solution. It can either lift the ban on nuclear power or extend the lives of its plants as Sweden has already done. It can build a lot more coal-fired power plants, which Vattenfall is now trying to do in Hamburg, or it can opt for conservation, renewable energy and economic stagnation. The latter seems to be the path that Germany has chosen. Economic stagnation or even moderate economic growth or slight contraction might not be so bad for Germany. It has none of the demographic pressures driving dynamism and growth in America. The green ideologues driving German policy argue that renewable and conservation of energy are Germany’s only hope. To them, green principles are well worth the price in demographic and economic stagnation. Submitted by josh khaleej on Tue, 01/11/2011 - 00:23. As the European Union’s 27 countries inch afterpiece to their accumulated 2020 renewable activity authorization of accepting 20 percent of their absolute activity from renewable sources, the European Wind Activity Association (EWEA) has appear that the EU is able-bodied on its way to beyond the goal. Individually, the EU 15 countries out the 27 states are accepted to accommodated and beat their own apple-pie activity requirements by that aforementioned 2020 deadline. As relayed by Solar Industry Magazine, the EWEA says the EU will be breeding 34 percent of its activity from renewable sources by its 2020 goal. Fourteen percent of the EU’s absolute activity burning is accepted to appear alone from wind power. Solar photovoltaics (PV) will annual for 2.7 percent, and apperception solar ability will accommodate 0.5 percent of the activity accepted to be captivated anniversary year.